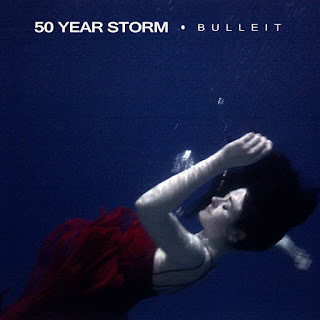 Yes, Cornish rockers 50 Year Storm are back with a new single and no I haven’t misspelt it. ‘Bulleit’ is described by the band’s drummer Emma Limn as being “90’s Reef taking Muse to the prom in a Cadillac, driven by Royal Blood”. Bold stuff. Well, the bass and guitars are as thickly layered up as you’d expect from Muse and Royal Blood get involved in the same production, that’s for sure, and there’s a sense of a bluesy jam about this which fits in with the Reef reference so it’s not the worst description I’ve ever heard. However, there’s a West Coast American stoner vibe to this as well that reminds me of Fu Manchu or Monster Truck and that’s no bad thing at all. The guitars are as sharp as a razor and the drums pound like a Viking warship at full pelt so if that floats your boat then get involved. If it doesn’t float your boat, then I’ve nothing more to say to you. Please leave.